Many of you have probably noticed already, but we've recently added our support to the utopian-io Indiegogo campaign, as well as the 10K Minnow initiative by @steemcommunity. We see the contributions made by both projects to add significant value to Steem, as well as the future direction of SteemPress that we look forward to sharing more information to you about soon. This post will give an overview of the two projects, what our contributions are, and how you can benefit from it or help contribute. Utopian recently launched an Indiegogo campaign for their upcoming Utopian Colony platform, the first interdisciplinary collaboration platform supporting all relevant skills required to making open source projects a success. In that regard, utopian is offering a special badge only available to Steemians who support their campaign and comes with a bundle of neat goods from different Steem apps! It As a long-time collaborator with Utopian, we decided to support their campaign by adding our own little treat to the bundle which was announced earlier in utopian-io's post here. Steempress is preparing the release of a new pro-version for its WordPress plugin where, for a fixed monthly subscription, the user will have access to unique features. These include custom benefactor settings for posts and comments made through their own website, as well as other benefits to be announced. Buyers of the Steemian Secret Perk will receive a voucher that can be exchanged for 1-month free access to SteemPress Pro-blog upon its release. Don’t have a SteemPress blog but love Steem and want to support its growth? SteemPress will let you gift your early free subscription to your favourite blog out there that is not yet on Steem, who will get a free Steem account upon verification. Should the website renew their SteemPress Pro-blog subscription, you will earn an affiliate reward as a bonus! We are very excited to be sharing more information with all of you shortly about the coming pro-editions of SteemPress, which will include features long sought after by many of our community members. Furthermore, it will mark the start of a new onboarding initiative by SteemPress to allow quick onboarding for new websites and their site-visitors. This will be accompanied by a new referral program, new ways for communities and blogs to connect, and a brand new profile and dashboard for your steempress blogs! Those of you who choose to support the Utopian indiegogo campaign by obtaining the Special Perk will receive a voucher that can be used to obtain early access to pro-version features, or be used as a onboarding pass for your favourite website once the SteemPress pro-blog version is released. Have an audience that may be interested in Utopian? Write a post! If you have an audience on your own blogs that may find Utopian and their quest for a more open web interesting, then we encourage you to write a post about them! We'll be on the lookout for good posts using both the #steempress and #utopian-io tags for the remaining of the indiegogo campaign and will give out extra curation to original posts. Let's show what an active community can do! We are also proud to be supporting the @steemcommunity's ambitious project to create 250 new "minnows" (a Steem account with more than 500SP) in a month. 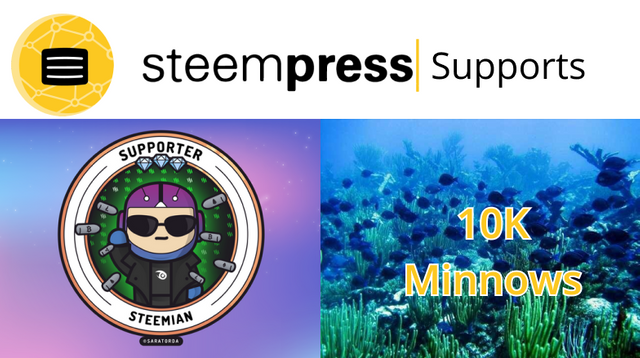 The goal of the project is to work strategically towards reaching a total of 10 000 "Minnow accounts" on the Steem blockchain. This will be done by encouraging accounts currently below 500 SP to power up until they have reached minnow-status, and then stay above 500 SP. SteemPress will be supporting their effort by increasing our curation on SteemPress users below 500 SP who have agreed with the organisers to power up / stop powering down to reach at least 500 STEEM Power. For more information about the project visit their first announcement post, and for more information about how to receive support from us visit the SteemPress Task post. Help give them a push! We encourage all of you to visit the SteemPress blog posts blogs written with the #tenkminnows tag, and help their growth by upvoting their posts, leaving encouraging comments and generally contributing to the positive growth of the community. An easy way to do so is to head over to steempress.io, select "SteemPress posts" on the upper left, and enter "tenkminnows" in the "Must have tags" field. Once you save this settings (along with any other you may prefer regarding post age, reputation etc) you'll be able to view all posts made with SteemPress containing the tag! Steem is an exciting blockchain in the way in which all businesses, communities and investors benefit from the independent success of other projects that attracts and retains new users, clients and investors. At SteemPress we see this as a key factor in the eventual success of Steem and would thus like to contribute in whichever way we can. Utopian has been of tremendous help dating back to the start of SteemPress, when it was only an idea and we sought confirmation from the Steem community that there was indeed demand for our intended product. At the time, utopian curation was crucial to keep the work going, and we think the same can and will happen for many other ideas to come that can provide complementary value to SteemPress and also add to the overall richness of Steem-based apps. Finally, with the Utopian colony, it will be interesting to see how we can outsource tasks to the community and allow anyone passionate to contribute with their skills to add value to SteemPress and other Steem apps. As for the 10K Minnows project, believe that helping improve the distribution of STEEM amongst active community members, and thus growing a larger Steem "middle class", will mean a better correlation between engagement from Steemians and rewards from posts. We believe this will contribute to a more engaging platform, where obtaining the attention and approval of more Steemians results in greater value obtained. With our coming pro-editions focusing to a large extent on incentivising more positive engagement and comments, it is crucial that there are many active Steemians whose votes matter. Looking beyond SteemPress, we think achieving a critical mass of early enthusiastic adopters with a long term intention to grow on Steem will help create the foundation for further growth. To vote for our witness, either use SteemConnect following this link or find us on https://steemit.com/~witnesses. Thank you for reading this far and for being interested in SteemPress! No thank you for putting in the time and effort to doing this in the first place! It is greatly needed. From what I observe, it takes only a few cents worth of curation to retain new users on the platform, people who have never received anything for posting content or contributing constructively to conversations online. The more accounts we have with enough SP to give out a few cents here and there, the more people we have who will help retain new users. As we all know so many are never picked up by curation projects, and thus leave when they never got seen by anyone, or didn't seem to get anything from their efforts. Thanks for creating the steempress plugin for WordPress, really has made it easier to get my blogs on to the steem blockchain whilst keeping the website relevant! Thanks you so much for your support of #TenKMinnows. We need more new users to keep this platform alive. I love that this project is going to bring minnows a feeling of success instead of a constant feeling of disappointment! This should put some life into the community. Great information on there ! I LOVE what you are all doing. This Minnow project is great and your plug-in might bring well-known blogs to the platform. Thanks for the updates, guys! Will be keeping an eye on this. I can't promise you a purchase of the pro version, but that all depends on whether or not my site even will use Wordpress. Maybe, maybe not. new onboarding initiative by SteemPress to allow quick onboarding for new websites and their site-visitors. Amazing. Thanks for doing the hard yards for our platform. It's really appreciated..
We're thankful to have such a great blockchain and supporting community to build on/with! Thanks for the support! Especially for newbies it is important to be seen recognized. It requires a lot of effort to post quality content. And I can imagine people leaving when they don’t get any form of interaction back for their efforts. That’s why I appreciate your support for both projects mentioned. The more collaboration between these projects, the sooner a greater audience can be reached and retained in Steem. Wow ... very interesting the 10K Minnows project, I am excited to know that this project will give the smallest fish in this environment a chance of success that encourages them, since receiving support from other curation projects can be difficult, besides this project could revive the emotion of many for the stem at this time, I hope that the 10k minnows project is a success. Wow! es realmente genial lo que hacen y han hecho durante este tiempo, que buen trabajo, los admiro! Thanks @steempress for assisting the #tenkminnows drive. This has benefited myself and also I've had the opportunity to use steempress and it's changed the way I blog on this site. Thank you! I've also seen that 'JSE Coin' plugin has been added. If there is any further information on this plugin and how it would work on my blog, i'd appreciate it.